rotjohns had the most liked content! That's all we've been seeing. I work near Lisle/Warrenville where this route is most prominent and it's been mostly 17500s with a few 15500s sprinkled in. 6612 is still there too, was out on Saturday. And the 665 runs right past the complexes on Cass Ave, but doesn't stop because it's going express to Metra. Depending on ridership, they might need to consider having it stop at Cass/67th to pick up those passengers, then run express to Metra. 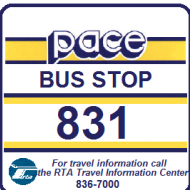 662 has a bus stop at Cass/63rd already so they should be able to accomodate also. Also, with the closeness of these routes to Metra (less than 2 miles), maybe more people are driving to the stations now. And with the popularity of the I-55 routes, folks could be heading to the Burr Ridge P&R. That lot was packed about 2 weeks ago when I passed by there around 8am. Hypothetical, but possible. Interestingly, most of these routes are ran by 30 footers. Wonder if we start seeing movement amongst them or potentially retire. 661 is an interesting one because it runs thru a major apartment complex in the area going to the Westmont Metra. Wonder why ridership isn't good over there. 824 probably makes sense, that route runs right off of Boughton Road, where the 855 bus stops are. One day, I saw a good 10 people get off just past the car wash on Boughton Road in the evening where awaiting rides were. If ridership is down, that's a clear reason why. Surprised 825 isn't on this list. Just trying to answer the other person's question. Moving on...thanks. Since 612 is an "on demand" service running from 9a-3p, it's probably going to be a para-transit bus. It makes more sense that the 754 would be ran by Heritage because Lewis University is in Romeoville, just a few miles from the Joliet Heritage station, where the rest of the MCIs are. No reason to bring a 6500 series from SW all the way downtown, then back to Lewis, espeically since one of the MCIs can easily finish it's I-55 shoulder route and run back out to Lewis. EDIT: Schedule for 754 shows Heritage as the garage. So it likely will be an MCI, not a 30-footer El Do. OK. Sounds like we need another official bus roster from AndreTheBusMan. That bus may be gone now (or at Ravinia). It's not out today and I haven't seen it in a while. We'll have to see what happens to the 6700s and whether or not they go back to NS in August, but it's clear that the 2003 NABIs remaining are slim. The only ones that are out there right now (8am this morning) are 6612, 6666, 6210, 6219, 6246, and 6251. So if there is a bus shortage as previously mentioned, it's because the NABIs are retiring fast. I have a feeling more movement with El Dorados within all divisions to retire these last 6 buses (and more if they are any left) is coming in the next week or two. I don't understand why with all this movement from SW, R, N, and W El Dorados, plus the 18500s in service. There really shouldn't be any 6600s remaining. http://wgntv.com/2018/06/18/9-injured-after-bolingbrook-bus-crash/ Moved the thread here. Interesting to see if #2749 comes back to service. On top of that, when I was out and about yesterday, there were quite a few 2003 and 2005 NABIs out, which surprised me. Also, remember artthouwill's post indicating he spoke to a bus driver who indicated that more El Dorados were coming due to the fact they were short buses at West. The 6300 El Dorados are 6 years old, maybe going thru mid-life rehab?